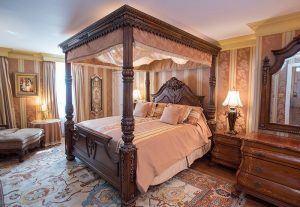 Whether it is decorated in real gold (think President Trump’s palatial Florida estate) or simple and elegant with ornately carved wooden posts, the four-poster bed has been an icon for wealth and stature for thousands of years. 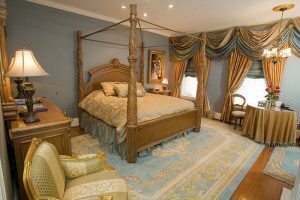 A four-poster bed is an antique style bed with four vertical columns on each corner of the bed frame. These beds are often large in size and some even feature a canopy, creating a focal point in any bedroom. For centuries, the bed has been a symbol of prosperity for royalty and nobility where large and lavishly decorated beds were available for the most elite sleeper. 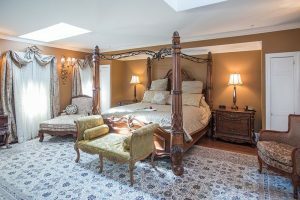 In the modern day, this dramatic bedding style adds an element of romance and elegance, something highly sought after when staying at a boutique bed and breakfast. 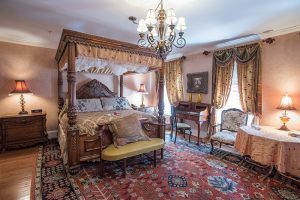 If you have never experienced the luxury of a four-poster bed, we invite you to join us at 1840’s Carrollton Inn where you can choose from seven out of our thirteen rooms that boast this exclusive feature.